The real scandal surrounding Anthony Weiner is that he is bigoted against Palestinians and has misused his position in Congress to support punitive policies against them. Americans appear to be bored by policy, titillated by private peccadilloes. But it is the policies that are important. Mahatma Gandhi was once kicked out of a brothel in South Africa. No one judges him by his lapses. Weiner, in contrast to Gandhi, has not worked for peace but has rather given knee-jerk support to the worst policies of the most far rightwing parties in Israel toward Palestinians. A social liberal in American terms, Weiner is so blinded by his allegiance to Israel and so studied in his ignorance of the Middle East that he has played a uniformly sinister role in that aspect of foreign policy. If he were replaced by, say, an up an up-and-coming Dominican-American politician from Queens who had some sympathy with Arabs, that would be all to the good. 9. Called Israel’s war on Gaza a “humane” war. 400 children were killed. 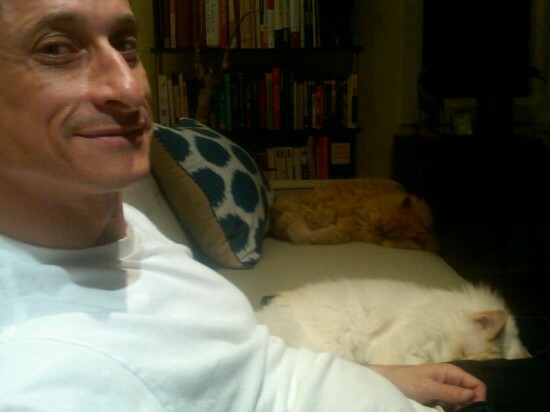 The following photograph was allegedly sent to the young woman from AnthonyWeiner@aol.com via BlackBerry on Wednesday, May 4, 2011, under the subject, “Me and the pussys”...LINK Weiner grooming one of his victims?